Our Proman product is proudly made at an accredited facility in the United States of America. We guarantee that all our Proman products undergo strict manufacturing practice standards. We also ensure that every product batch is rigorously tested and goes through a stringent quality control process to ensure that every bottle contains all the ingredients that it says it has. Buy Proman with confidence. The Prostate is an essential part of the manhood of any man. Over the years, prostate health was widely recognized to be important for men who are 50 years and over. However, in the recent years, there has been an increase in prostate problems in men in their 30s and even 40s. Some of the factors that contribute to declining prostate health include environmental factors, diet, and lifestyle habits. Our Proman product is selectively manufactured to handle all your issues affecting this important gland and support a healthy prostate. 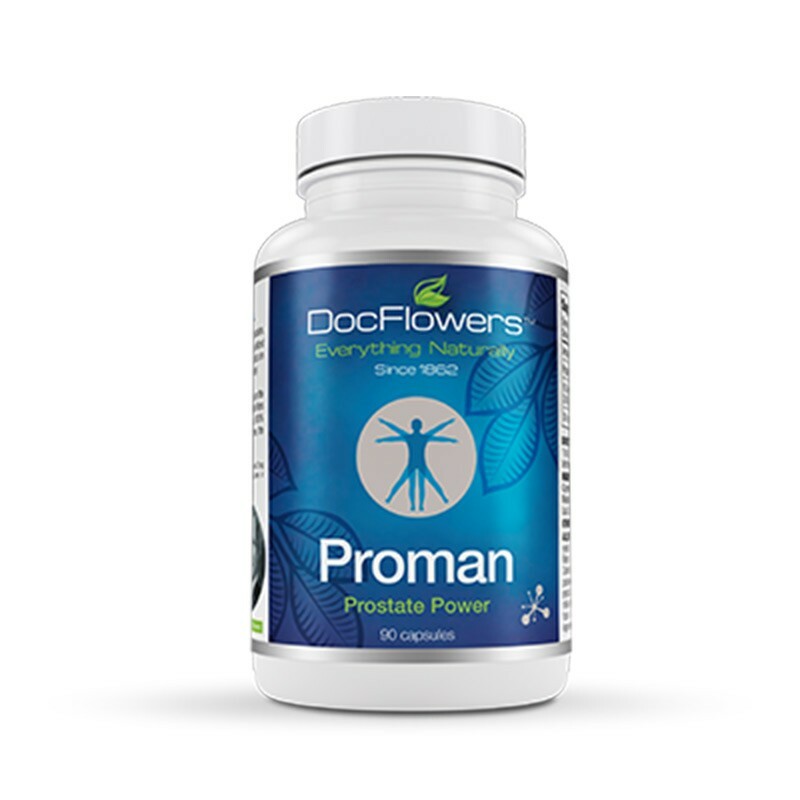 Proman is made using all natural ingredients that will support prostate health.These include: ginseng powder, juniper berries, parsley leaf, ginger root, marshmallow root, saw palmetto, golden seal powder, cayenne pepper, uvaursi, and queen of the meadow. Proman also contains gelatin and purified water. These all-natural, healthy ingredients have powerful anti-inflammatory, pain-relieving, immune boosting, and antioxidant properties that are necessary for treating prostatitis, relieving urination problems, and supporting prostate health. Our extra strength and powerful prostate supplement supports prostate health safely regardless of age. Proman pills have the combined power of different natural herbal products that naturally promote the health of the prostate gland and the urinary tract. Taken once daily, Proman will promote your vitality and overall wellbeing. Our team at Doc Flowers has formulated the perfect herbal blend that is guaranteed to support the health of your prostate. Proman capsules contain carefully formulated quantities of different herbal remedies to provide maximum benefits. Our pills do not contain any chemicals, sugars, gluten, artificial ingredients or preservatives. Our formula is also non-GMO so you can be confident that you are using an all-natural prostate supplement. Instead of using multiple supplements, we have formulated a one pill prostate supplement that has the right therapeutic dosage to support your prostate health. You will notice a difference within one or two weeks of using our natural supplement pills. Proman supplement is curated with clinically tested and effective ingredients that will support tissue integrity to enable you to achieve optimal, lifelong health. Proman is available in a bottle containing 90 capsules. Our expertise and experience in producing all-natural herbal remedies for centuries are at the heart of each formula that we create. We also balance scientific research and technology and the wisdom of nature through our natural health supplements. Our herbal prostate nutritional product will enhance your prostate health, boost your sexual performance and increase virility. Support prostate function and normal urinary flow with Proman all-natural supplement today.